Below I present a simple way to automatically annotate plots through Shiny It occurred to me that labeling plots should be really easy to do with R-studio’s swanky ‘Shiny’ add on. To test this I gathered some time series data from Wikipedia, added options for the number of points to be labelled, either by date or by view count. I also quickly added some custom labels. To test it, have a play with the app below. It’s not very flexible; I’ve set it to only fetch data for December 2011, but the code is available here for anyone who wants to expand this feature. By default it shows English language Wikipedia views for the Russian blogger Navalny. He emerged as one of the Russian protest movement leaders. 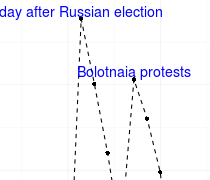 The peaks in the graph correspond to the election on December 5th and the following street protests. There is also a peak in searches for Navalny after he was released from jail on December 20 2011.